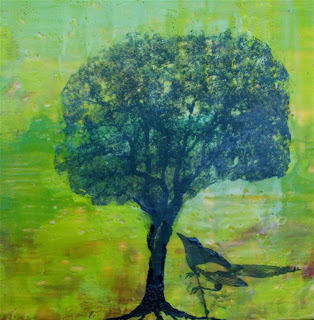 I have created another Tree Encaustic...using photo transfers of photos I am taking all around Sonoma County...for this series. This one so looks like the mountain is on fire in the background. This tree is in the Cazadero Hills of Sonoma County, in the coastal range, on the Gualala Ranch. It is not very far from where the Creighton Ridge Fire started in 1978. With the hot dry weather and all of the fires all over NOrthern California...this piece is rather poignant. Counting Blessings...an ongoing altered book process. "If the Only prayer you said in your whole life was "thank you" that would suffice." About three weeks ago I dreamed about creating a Gratitude Book and the cover appearing in my dream. It was called " Counting Blessings"
in my life on what I am grateful for. 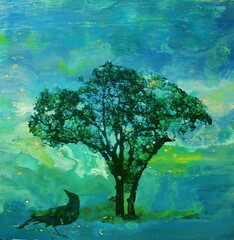 Well, I have completed the second encaustic in my tree series. I like this one. Each one takes on a different mood. They are rather dreamlike. I am pleased to be back in the studio with the encaustics. I feel so grateful and blessed these day. I have been photographing trees lately with this idea in mind of doing a series of photo transfers on encaustic. This is my first attempt and I feel it is pretty successful. Up to this point I have been working with alot of texture and scraffito in my encaustic paintings. In what will be a new series, I plan on focusing on color and its luminescent possiblities. I photographed this tree up a Spring Lake park in Santa Rosa, while visiting my friend Robin who was camping up there. I am excited by it.. This is my first successful attempt at doing photo transfer. There are so many beautiful trees in this area. This encaustic painting is 10"x 10" on wood.